Now that spring is behind us, and summer has officially begun, don’t leave the pruning of your spring-flowering shrubs any longer. Ideally it should be done immediately after they flower, so for next year, make a note. However, ‘better late than never’, so if you didn’t do it yet, bring it to the top of your list. There is often confusion about pruning, and many inexperienced gardeners just do one major trimming of all their shrubs and trees in late winter, which is a mistake. It is best to divide your plants into two groups, based on when they flower. The first group is all those shrubs that bloom early, either before the leaves emerge, or immediately after. This would include Forsythia, larger Spirea, Lilacs, and all the Rhododendrons and azaleas. The second group are those plants that send up new shoots, only later developing flower buds on them, and blooming in summer and fall. Top of that list would be hydrangea, but also crape myrtle, and roses. The pruning of this second group has already been discussed in a recent blog, because that is the group you prune first, usually in late winter, before any new growth is seen. In this blog we are going to look at the pruning of those shrubs and trees that flower in spring. They should be pruned more-or-less immediately after they finish blooming. Not all need a lot of pruning, and we will look later at some specific examples, but first, some general principles. The flower buds of spring flowering plants form as the new growth from the season matures. In some plants, these can be seen developing on the stems as the season progresses – in camellias for example, the flower beds are already noticeable as the new shoots begin to mature, because they are slightly larger than leaf buds. By fall they are already very large, and easily seen. In other plants, they will not be that visible, but they are there. Our goal is to have as much bloom as possible, and to achieve that we need to leave all that growth, from the summer before, intact. If we also want to control the size of our plants a little, and shape them, it is obvious that we need to do that before the new growth has formed, not after, or we will reduce the amount of growth ready to flower. Spring flowering shrubs and trees produce their flowers when there are no, or just a few, leaves visible, so by pruning immediately after they flower, we allow a full season for new growth to develop untouched, and we maximize flower production. The amount of pruning we do will depend on the plant, and the most basic and limited is simply to remove the finished flower clusters. Gardener’s may ask, “Why bother?”, and of course they are partly correct – the plant won’t mind if we leave them. However, if they are left, they will often produce fruit and seeds, and the resources of the plant will go into that, rather than into making flowers for the next year, which is what we usually want. Obviously if the tree is a fruit tree, we do want the fruits, but for many ornamental trees and shrubs they are unwanted, and can even become a problem, creating weedy seedlings all over the garden. For those reasons, and for general tidiness, removing dead flower clusters on plants like rhododendrons and lilacs is a very worthwhile activity. For rhododendrons, the best way is by hand, simply snapping off the stalk that holds the flowers, once the petals have fallen. Don’t be afraid – just bend the stem above the first leaves, and it will snap off. With a bit of practice you will become quick at this, and it is a simple and pleasant job. Soon you will be rewarded by seeing several new shoots come from buds among those uppermost leaves, with the promise of next year’s flowers in them. For lilacs you will probably need to use a pair of hand-pruners to remove the old flowers, and that brings us to consider what kind to buy. There are two main types of hand-pruners available, called ‘anvil’ and ‘by-pass’. Although often sold, anvil pruners are not recommended, and a by-pass pair is best. These have a type of scissor action, with a sharp, curving blade that slides past a second blade that is broad and curved, to hold the branch while you cut it. Anvil pruners have a straight blade that presses down against a flat second blade. They work well when new, but even the smallest damage to the blade means they don’t cut cleanly through the bark. The cut will tear the bark, and that leaves the stem damaged and more likely to die back, or become diseased. Save any anvil pruners you already have for picking flowers, and invest in a quality pair of by-pass pruners. Some brands allow you to buy replacement blades, and that is always helpful, as simply changing the blade will give you a brand-new pair. Cheap pruners are always a bad investment. If you look at your by-pass pruners, you will see that when you cut a stem, the flat blade presses in the wood as the cut is made. This crushes the bark slightly, and can cause die-back. Notice that the other side of the blade has a clean cut. 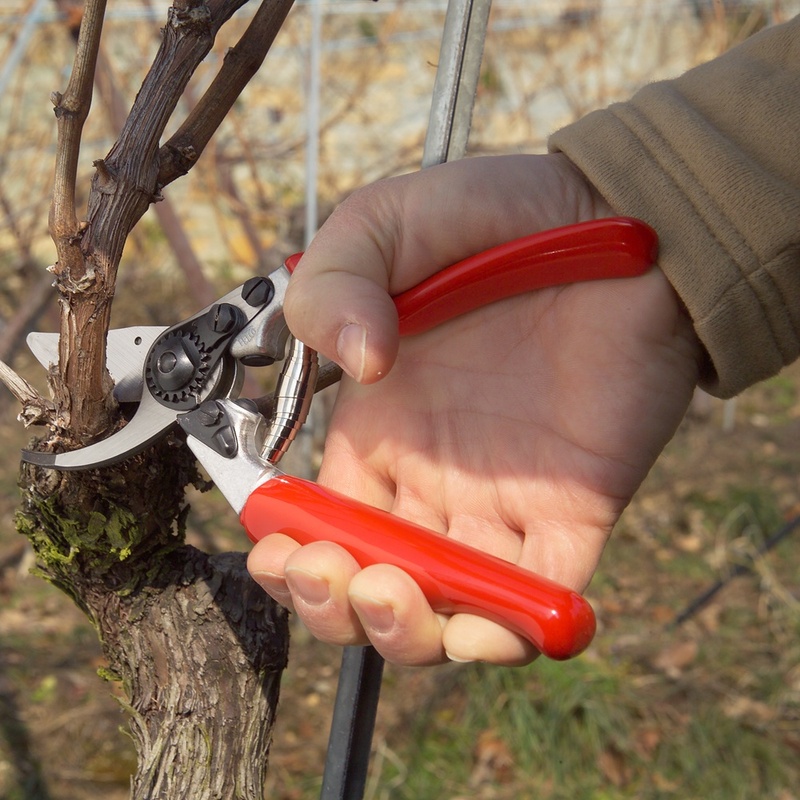 When cutting, always hold the pruners so that they clean cut is on the part of the stem remaining on the plant, and the crushed part of the piece you cut off. At first turning them around will feel awkward, but soon it will become second-nature, so persevere – it’s worth it! It looks like that is all we can discuss here, so in the next blog we will continue with this important topic, and look in more detail on selecting the branches to remove, and how much pruning to do.